In Tokyo last month, Ramen Chemistry sat down to talk about the ramen business with two chefs, one (Keiichi Machida) an established Tokyo presence who's about to open an outpost in Toronto, the other (Satoshi Akimoto) an engineer who just quit his job at Nissan to open his first restaurant in India. These meetings, one planned and one by chance, were of special interest to us. Both chefs are examples of people who, like us, got into the ramen business from outside of the restaurant world. And all three of us are today working on projects to bring ramen to newer markets outside of Japan. I asked both whether I could profile them at Ramen Chemistry. Then, like the (diligent) lawyer that I am, I pulled out a notebook, and took a (low-key and cooperative) deposition of each. Hiroko translated between me and Machida, but Akimoto and I talked directly. Today I'll profile Machida, and later this week will profile Akimoto. According to Keiichi Machida, "passion" is the key to a successful career in ramen. We met Machida at the bar at Kyouka, his restaurant in Tachikawa, a somewhat anonymous and remote district in the deep and dense urban expanse west of Tokyo. Hiroko had gotten to know him last fall when he taught her about ramen at Shoku no Dojo. The two of them talked about Shiba Ramen's kitchen design plans while I took pictures of the space and the food. Afterward, we headed to a local cafe for Japanese desserts (black sesame ice cream parfait for me) and talked to Machida about his life in ramen. Fifteen years ago, Machida made a living as the owner of a small petrochemical import company. He apparently started making ramen broth after buying some pork bones for his german shepherd. He had to cook the bones to make them edible for the dog, and decided to put the soup stock to use. Around this time, he was sitting around with his family over the New Year holiday, watching TV. They randomly saw a program that featured a segment about a ramen museum and restaurant complex in Yokohama (pictures below), which was hosting a televised competition looking to discover creative new ramen chefs. Since he'd been making soup, his family thought he should check it out. So at the spur of the moment, they took a field trip to the museum. They actually weren't too impressed with what they ate there, and thought they could do better. Machida's family encouraged him sign up for the TV contest. He went for it. 422 people entered the competition. The first rounds were on paper, narrowing the field before the televised portion. Machida advanced. At this point, he realized he actually needed to learn something about making ramen! So he went to a meat supplier, and asked what ingredients other restaurants were using. And he went around and ate a lot of ramen. He even rooted around in some ramen shop's garbage to find out what supplies it was buying! It all worked: he ended up making it to the semifinals. After that, he spent a year eating ramen and refining his recipes before opening Kyouka. He started off specializing in chicken chintan ramen (i.e., clear chicken ramen). He explained to us that from the start he had some notoriety in the ramen scene, because of his TV appearance and the media attention that followed. Because he was talked up in the food media as some kind of "charismatic chef," (apparently there was some public infatuation with Japanese celebrity ramen chefs at the time), he felt pressure to innovate. So about two years in, he started seriously studying ramen, becoming empirical and systematic in his approach to product development. Today he's known for shoyu (soy) ramen. He emphasizes complex recipes with natural ingredients. He uses over twenty ingredients just in the soup of his ramen, not including the tare, oils, or toppings. He even uses six different types of niboshi (dried sardines)! As I mentioned in my post about Tokyo ramen, my reaction to his soup was that it has some deep essence of the ocean, without being fishy. The recipe must be really refined to make a product like this. We suspect it would be pretty expensive to make a product like this in the U.S. given the limited availability of Japanese specialty ingredients. After 15 years of running only Kyouka, Machida is now in expansion mode. While he still works in the kitchen at Kyouka once a week or so, handling special recipes, he's opening a food court kiosk down the street in Tachikawa later this year, where he expects to serve 1000 bowls a day! He's become the consulting chef for a new pair of Toronto shops, called Touhenboku Ramen. 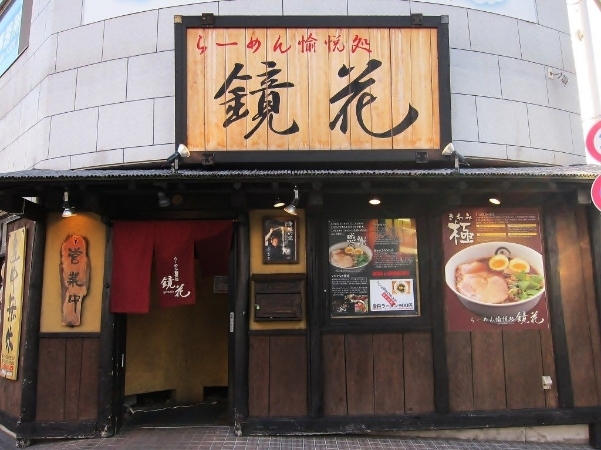 Touhenboku is owned by Zuimei Okuyama, who Machida helped train at Shoku no Dojo last year, and it specializes in chicken-based ramen. And now that he has some familiarity with the Toronto scene, he's planning to open an outpost of Kyouka there within the next year. Touhenboku Ramen. Machida serves up ramen in Toronto. Image www.torontolife.com. We asked Machida how ramen has changed in Japan over the course of his career. He explained that before he got into the business, Japanese ramen underwent successive style trends, usually focusing on regional specialties; there was a Sapporo miso boom, and a Kyushu tonkotsu boom. When he started off, the focus had shifted from the ramen to the chefs themselves. Later there was a trend toward thick, rich broths. But it's expensive to make thick broths, and the ramen scene reacted with a tsukemen trend (tsukemen is a style of soupless ramen where the noodles are dipped in a sauce, and it's cheaper to make). After that, simplified tastes took over (Machida gave an example of chicken ramen that emphasized the flavor of chicken). Now he thinks ramen has become really fragmented, the sheer amount of competition causing restaurants to distinguish themselves in ever-increasing varieties, often employing singular strong or unique flavors. Machida also gave his opinion of ramen in the U.S. He thinks that New York ramen beats out the West Coast. The New York ramen scene is more mature, he explained, and the ramen there is often better than in Japan. I say let's see what we can do about that out here in California! Next time, ramen in India.